Stainless steel escutcheon to match the SWL stainless steel door lever handles. Size 52mm diameter, 7mm depth. 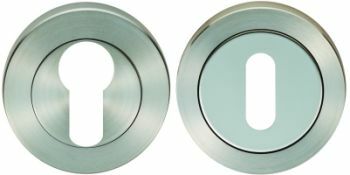 Available in Satin Stainless Steel & Dual Finish Polished with Satin Stainless Steel for standard lock and euro profile cylinders.